From what I understand the conclusion is wrong, because it is not said that A is a sufficient condition for B, (and there may be other conditions required for B, so if they are not present B won't be the case, even if A is the case.). But I have trouble finding a real life example to this and I'm not sure if it is the consept that I don't understand or it is just the way we express ourselves in natural language that causes the confusion. So turning the router on is a necessary condition for having internet but can you then say: "If you turn the router on (A), there will be internet (B)." Saying that is just is not true. So is it just that we don't have a good way to express sufficient conditions (in comparison to necessary conditions) or is it that I just don't understanding some fundamental concept (or both)? There are multiple good answers here, including references to modus tollens and the contrapositive (both of which are correct). What helps me understand this concept is a more intuitive/layman's perspective. However, if you have an umbrella, does it mean that it's raining? Well, no. You might be bringing an umbrella for a trip, using it as a parasol in the scorching summer sun, or even simply returning it to a friend. And that makes sense to us. If it were raining, you would've brought your umbrella. We said that you ALWAYS bring an umbrella if it's raining. So if you don't have it, it can't possibly be raining. "In order to have internet (B), the router must be on (A). So, if there is no internet (not-B), that means the router is not on (not-A)"
If we have an Internet connection (A), the router must be on (B). But if the router isn't on, then we can't possibly connect to the Internet. (How would we even do that?) We know this is the case, because we said that if we're connected to the Internet, the router MUST be on. Edit: My "rain" example was criticized for clarity, since the real-life relationship isn't as straightforward. (Fair enough.) We can apply the same thing to dogs, though, and it works the same way but exploits the IS-A/inheritance relationship you're probably familiar with if you have a CS background. All corgis are dogs. But are all dogs corgis? No! However, we DO know that if it's not a dog, it's clearly not a Corgi (since a Corgi is a type of dog). Also, to echo the other users: this is not a fallacy. You can find more about logical fallacies here. ‘If not B then not A’ is the contrapositive of ‘If A then B’ and is logically valid. By saying ‘if A then B’, the author is saying that whenever A happens, B will definitely happen. Hence, if B does not happen, it is clear that A did not happen (if not B then not A). You are correct: The statement does not show a sufficient condition! Consider this statement: "If (A) it rains, then (B) the street will be wet." Assuming the street is always wet after it rained (because it is not covered by a roof or something), the contraposition would hold true! Contraposition: "If the street is not wet, it did not rain"
I think what is giving you troubles is that the street in this example can be wet without rain (someone sprayed water onto it), therefore the street is not always wet just because of rain. That's called an inverse and differentiation can sometimes be hard. If [a: there is fire], then [b: there is smoke]. If [not(b): there is no smoke], then [not(a): there is no fire]. This makes intuitive sense - we're not observing the effect that is always produced by the cause, so the cause can't be occurring. It can happen that there is no fire and no smoke. It can happen that there is no fire, but there is smoke (which might be produced by something else than fire). It can not happen that there is fire but no smoke. It can happen that there is both fire and smoke. 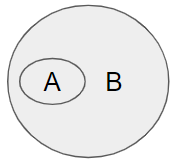 The not(b) -> not(a) is identical to the a -> b column, so the two statements are logically equivalent. If [a: you have internet], then [b: the router is on]. It can happen that you don't have internet and the router is off. It can happen that you don't have internet, but the router is on (so you've got a tech problem somewhere). It can not happen that you've got internet but the router is off. It can happen that you've got internet and the router is on. If [not(b): the router is off], then [not(a): you don't have internet]. What you have written is "if B then A. Not B, therefore not A"--which is of course invalid reasoning. A better way of putting an example of the contrapositive into natural language would be "If we have an internet [connection], then the router is on. The router is off [not on], therefore we do not have an internet [connection]." Which is a valid argument of the contrapositive form. It's not a fallacy, but it's only guaranteed to hold in Aristotelian logic, where we have the law of the excluded middle, which states that every proposition is either true or false. Example: Anyone who is a Christian believes that Jesus is their savior. A is the proposition that my dog is a Christian. B is the proposition that my dog has a belief in Jesus as her savior. Now B is false, because my dog has no belief in Jesus as her savior. If you're working in Aristotelian logic, then it's a perfectly valid logical conclusion to say that my dog is not a Christian: if B is false, then A must be false. But it's at least as reasonable to apply non-Aristotelian logic here. We can say that Christian and non-Christian are silly categories to apply to a dog. Then we say that neither A nor not-A is true. The truth-value of A is undefined. The fact that B is false tells us that A is not true, but it doesn't tell us that not-A is true. Most mathematicians spend most or all of their time working within Aristotelian logic, but that doesn't mean that non-Aristotelian logic is invalid or not accepted by the mathematical community. Similarly, some people play basketball, some play tennis, and some play both. There is no controversy over which set of rules is the right set of rules, and everyone understands implicitly which set of rules is agreed upon when they're playing. In most cases in everyday life, Aristotelian logic just isn't a good model of how we reason about the world. If a friend asserts that jazz is more fun than pop music, I would probably answer, "Well, yes and no..."
"In order to have internet, the router must be on" corresponds to the implication "if there is internet, the router is on." The contrapositive is "if the router is not on, there is no internet." Your translation from natural English to formal logic is where you go wrong. "If-A then B" precisely means that A is a sufficient condition for B. - Ie if we have case A we can know that we also have case B. "In order to have internet (B), the router must be on (A)." describes a necessary condition. This can be written as "Only if A then B" or "If B then A". The contrapositive would be "If Not-A then Not-B"; Ie. "If the router is not on then we do not have internet." Yes, you are confused due to the use of some natural language which are by nature all ambiguous/not precise (but that makes them very powerful!). Ancient philosophers were strongly interested on this problem and that leads to formal logic. if it's raining then the ground is wet. if the ground is not wet then it is not raining. Sorry for @eurieka's answer but his example is not so good due to the fact that the real life relation in between rain and umbrella use is not so direct (I never use umbrella raining or not). While it is more easy to agree on rain and wet ground. In formal logic you can't repudiate a contrapositive, if you think the contrapositive is not correct then the initial proposition is also wrong. In formal logic, you can't state something like : router on implies internet accessible, and then after add another condition about provider state. If it is the case, then you need to reformulate your problem taking into account everything. If A, then B == If it's a Duck then it can swim. if not-B, then not-A == If this little guy can't swim, then it cannot be a duck. Why? Because a duck can swim! how can it be a duck but cannot swim? Isn't this logic easy to see? As others have said, this is not a fallacy. "If A then B" means that A is a subset of B. Anything outside of B ("not-B") is clearly "not-A"
For good measure, if you also want to consider "not-A", this means "everything outside of A", which could be B, but could also mean "not-B". "If A, then B. Therefore, if not-B, then not-A"
"If there is A, then there must be a B--every time. Therefore, if there is no B, there could not have been an A, because had there been an A the rule is that there must be a B. So in any case where there is no B, there must have been no A." It is not a fallacy, but rather a mistranslation. If you have something that comes before therefore, it is already a premise. Is already supposed to be the case. It does not say that there are other premises that contribute to the conditional. It is analogous to: If it is raining then there are clouds. And we can infer from it that if there are no clouds then there is not raining. So, there is no fallacy here. But remember this : Deductive reasoning is about the logical form of your argument. If we suppose (just suppose) that the conditional if A then B is true, then it follows that the conditional If not-B then not-A is true. Suppose that the conditional if A then B lacks C, which is also needed for B to take place. Well, that's not deductive problem (not a non-sequitur), but it is a problem related either to the truth or reliability of the premise, or simply a mistranslation as I suggested. If I say that If you worked then you did make money , then it is the same as if I say if you did not make money, then you did not work. But whether work is sufficient to make money or not, that's another subject. Deductive arguments are only about the truth of the conclusion, given the premises are true. In this case in order to have internet (B) the router must be on (A) should not be translated to if A then B , but instead if B then A. If there is internet -B- then the router is ON -A-. therefore, if the router is not-On then there is no-Internet. So, your premise was mistranslated . Consider the clouds example, to see what I mean : Even though clouds can cause rain (with other factors), it does not mean that clouds should be the antecedent in a conditional, so if there are clouds then it is raining is a false premise. But it means that if it rains then there are clouds, so the cause should be a consequent, not an antecedent. Think about it. Another way of looking at this is with a diagram. But that's exactly the same diagram you'd get for “If not-B then not-A.” So the two are equivalent. I think that you need to express the problem as so: If A->B implies that B will happen ALWAYS when A has occurred. Then, if B has not occurred, you are sure that A has not occurred. If F is a sufficient condition for G, is lacking G a sufficient condition for lacking F? What fallacy accepts P and P → Q but rejects Q (denies modus ponens)?